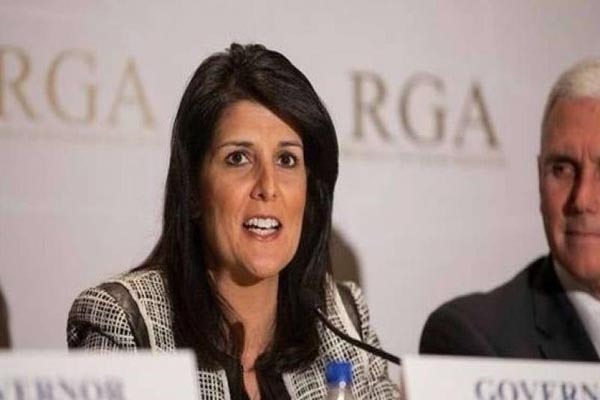 New York(PTI): Nikki Haley is travelling to India for the first time as the US Ambassador to the UN on a two-day visit during which she will meet senior Indian officials, business leaders and students, underscoring America’s “strong alliance” with the country. Haley will travel to New Delhi from June 26-28 during which she will meet with senior Indian government officials, NGO leaders, and the interfaith community “to underscore the United States’ shared values and strong alliance with the people of India,” a brief media advisory from the US Mission to the UN said here yesterday. While the media advisory did not give further details of the 46-year-old diplomat’s programme during her visit, she could call on Prime Minister Narendra Modi and is likely to meet senior officials from the Ministry of External Affairs. The visit to India by one of the Republican party’s rising stars comes just days before US Secretary of State Michael Pompeo and Secretary of Defense James Mattis will host External Affairs Minister Sushma Swaraj and Minister of Defense Nirmala Sitharaman in Washington for the inaugural US-India 2+2 Dialogue on July 6. Haley’s visit assumes significance as the Trump administration walks away from key multi-lateral pacts, re-writing American engagement with its key western allies. Haley’s visit comes just days after she announced, along side Pompeo, that the US was withdrawing from the UN Human Rights Council. Following Washington’s withdrawal from the Iran deal and the re-imposition of sanctions, Swaraj had said at a press conference in New Delhi that India will comply with UN sanctions and not any country-specific sanctions. Last month, she had also met Iran’s visiting Foreign Minster Javad Zarif during which he sought India’s support in salvaging Iran’s nuclear deal with leading world powers in the wake of the US pull out from it.